Happy 1st Monday of August! I posted about Where I Get Moving this past Saturday when the month started and encouraged setting your personal intentions during this last full month of summer time. I think I have mentioned before that we usually “reset” around here with a dairy and gluten free meal at the start of the week. This weekend was not very productive but definitely fun with get togethers and exciting projects. However, I have more catch-up to do than time to cook! Bella, on the other hand, lounged and continues to! 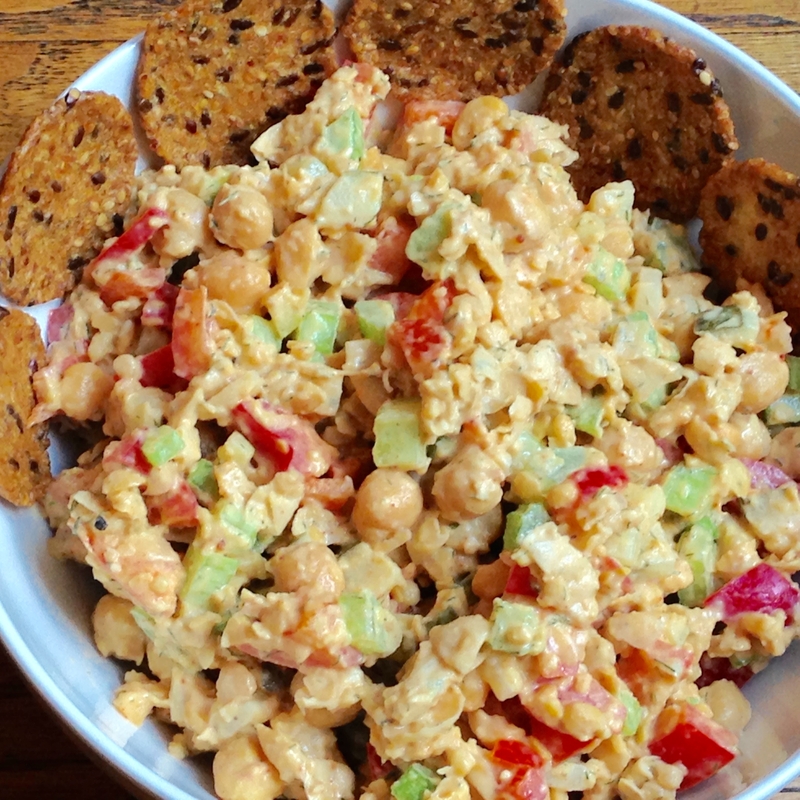 Chickpea salad has been quite the discovery for me! 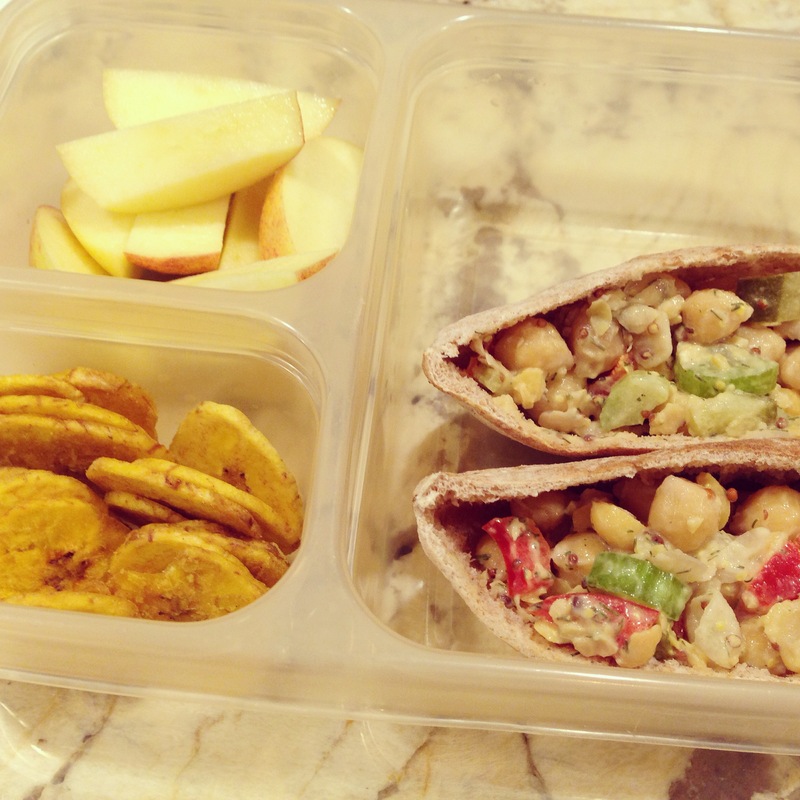 It has given us a tasty, tangy, lunch option that lasts days, does not spoil easily, and is perfect for a quick meal prep. I especially like the varying textures in this recipe. From crispy raw veggies to the tart combo of pickles, mustard, and lemon juice, this dish can be adjusted and pleasing to many diets and palates. 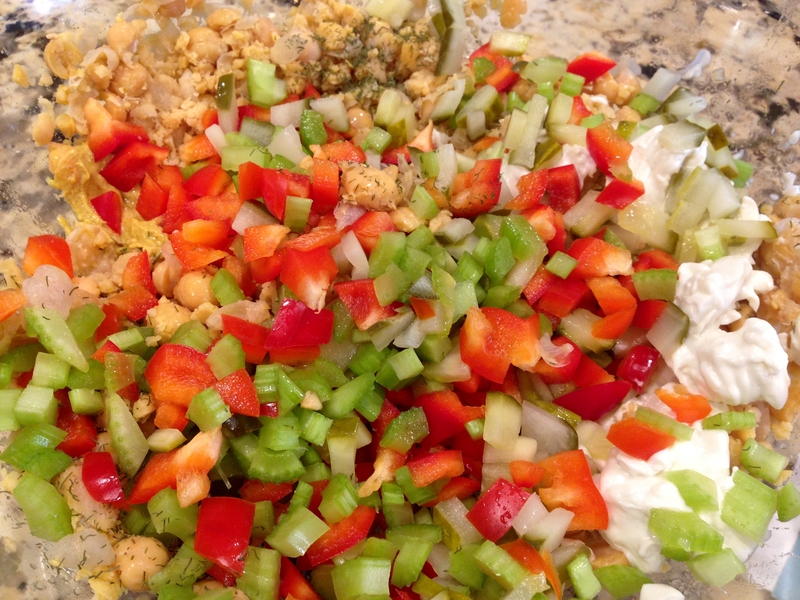 Omit the scallions, garlic, substitute another veggie, add cucumbers, carrots, a different type of pepper – about anything will work. If you’re not a fan of dill, consider parsley, other dried or fresh herbs, and you can even delete the herbs and just use salt and pepper. 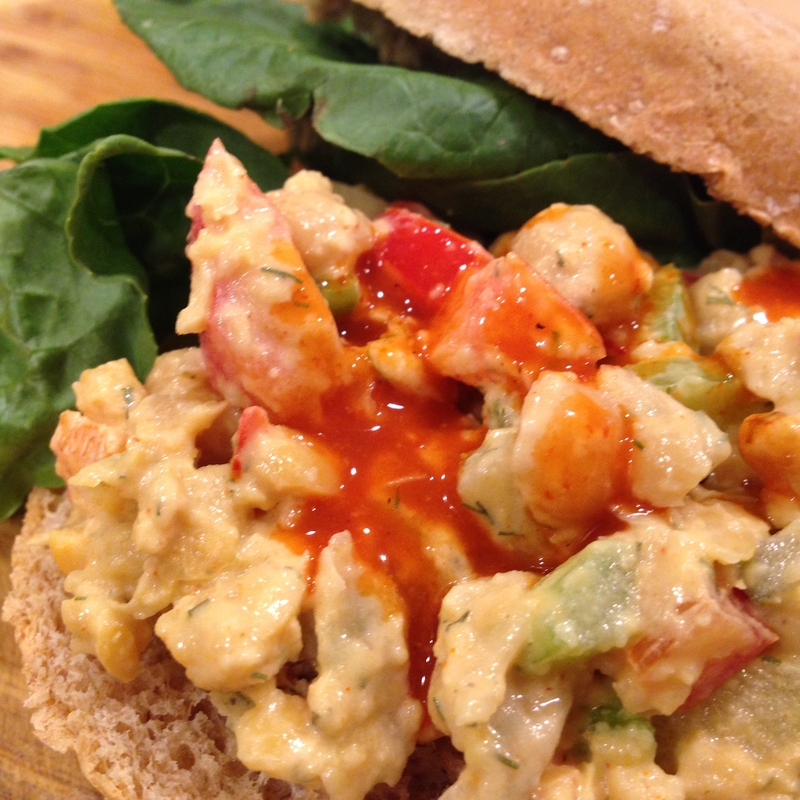 I have used some smoked paprika before too and that was a favorite amongst the gentlemen. I have been told that the creaminess and flavor profile is similar to a tuna or chicken salad and my friends love having it for Meatless Monday as well as during a vegan cleanse. I make a big batch at the beginning of the week and it lasts for several days. Because there is no dairy or animal products involved, it holds up really well at the pool, swim meets, outdoor potlucks, beach, park picnic, or travel! It tastes best chilled but it is also delicious freshly made. I packed it up for a road trip too! I have served it at luncheons, baby and bridal showers, put it in my kids’ lunch boxes, and munched on it myself for days in a row! It holds together well and one scoop contains so many good-for-you bits! 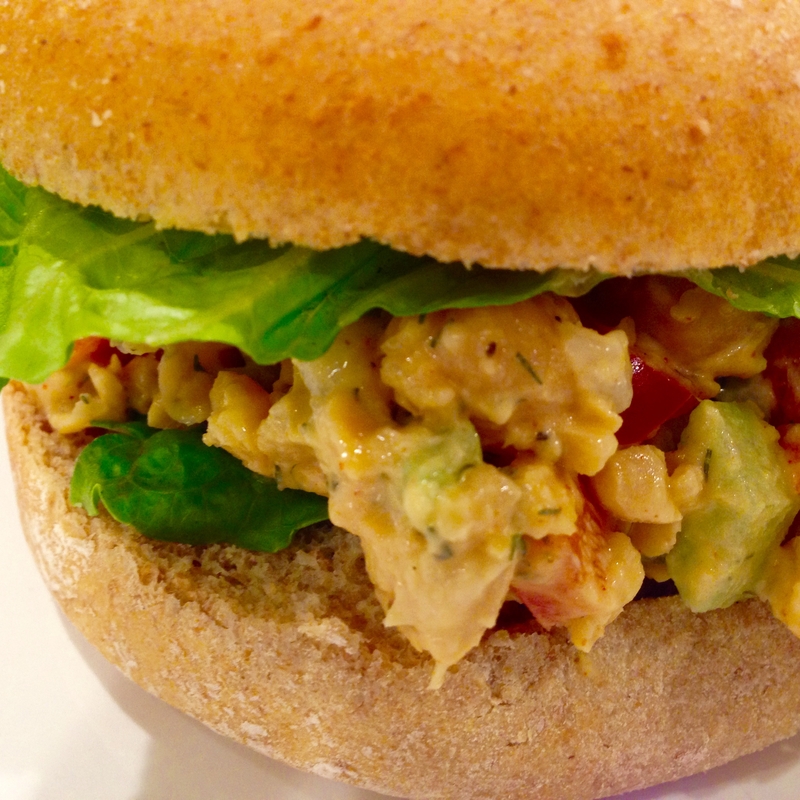 I was inspired by trying the Perfected Chickpea Salad Sandwich in the Oh She Glows Cookbook by Angela Liddon. I made it twice and then decided to just use what I have and eyeball measurements whenever I make it now. My modifications turned out really well last time so that’s what I summarized below for you. Her recipes are dairy-free and mostly gluten-free and although I’m not vegan, her creations will make you forget that you are having exclusively plant-based meals. I like to take a few minutes to prep what I need so I can go ahead and combine it rapidly. 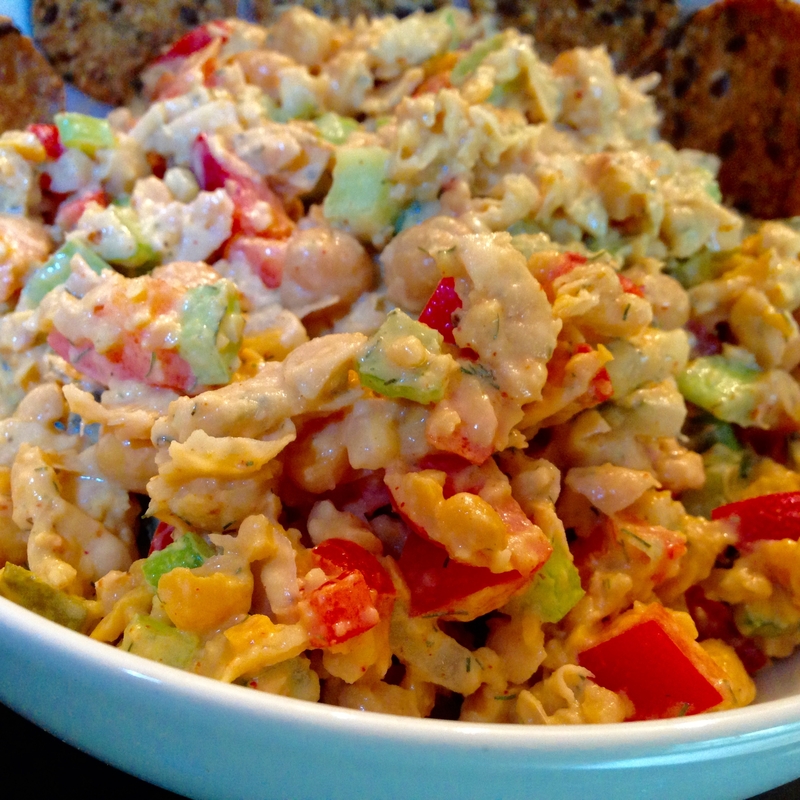 Salad may be in the name, but feel free to present as an appetizer or dip with some crackers. It holds together well and one scoop contains so many good-for-you bits! 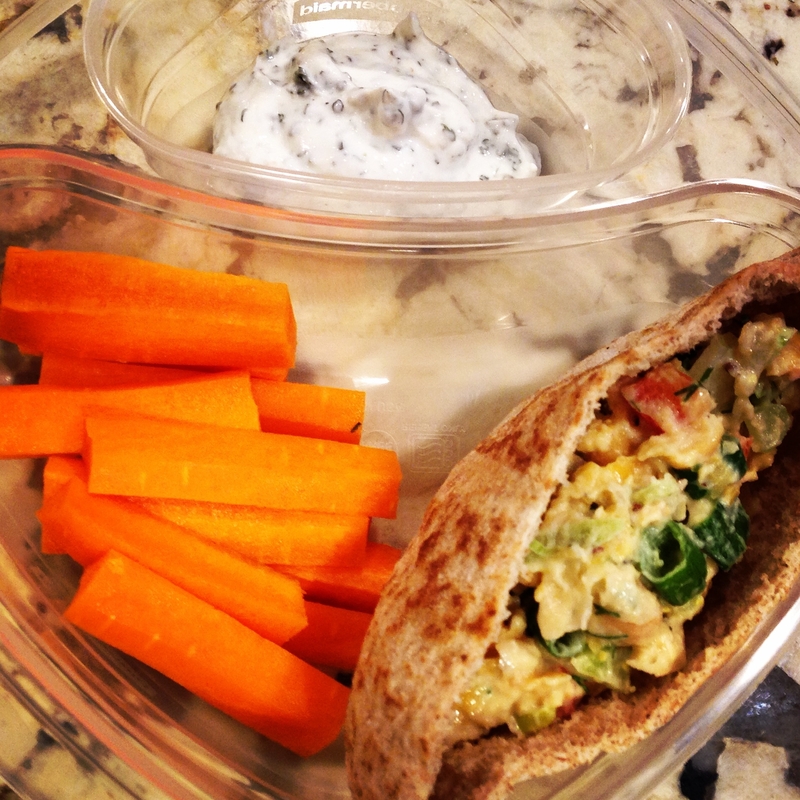 On its own, in a bun, pita pocket, between slices of bread, rolled in a tortilla, or as a lettuce wrap, Cool & Creamy Chickpea Salad is DELISH! I appreciate that it is hearty and filling but a cold eat on these hot days. Hot sauce for life though. 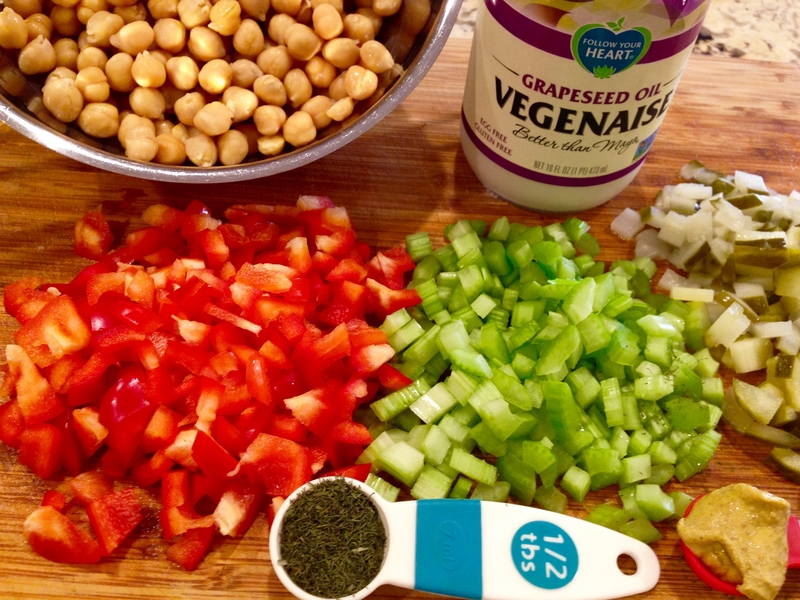 In a large bowl, mash chickpeas with a fork or potato masher just until most are smashed. Previous post: Where I Get Moving!